Nursing EZ Plus Pillow Discounts Apply ! 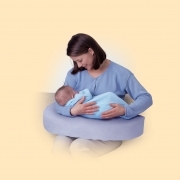 The Nursing EZ Plus pillow is a wonderful lifesaver for moms and babies alike. Whether you breastfeed or bottle feed (or a combination of both), this pillow fully supports baby, relieving mom (or dad's) neck and back strain. This is a great way to feed twins, too! Available for shipment in the continental United States only. *This item must be shipped separately from other items in your order.